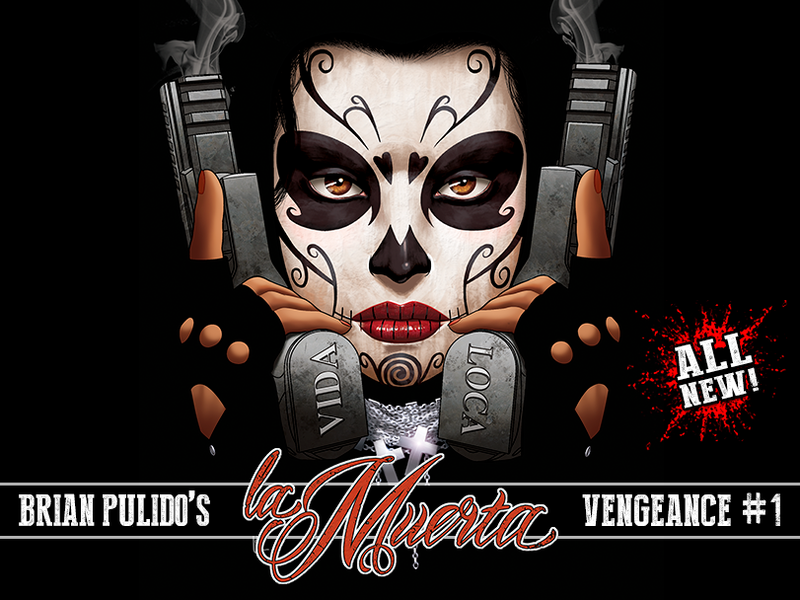 « MORE LA MUERTA: VENGEANCE INFO + EVERYTHING WE KNOW SO FAR ABOUT COFFIN COMICS FEST! La Muerta #1: Vengeance is a 48-page square-bound graphic novel that continues the two-part story established so far in 2016’s La Muerta series (Descent and Last Rites). This new chapter will be brought to life by series creator Brian Pulido and writer Mike MacLean (La Muerta, Lady Death). Series illustrator Joel Gomez and series colorist Ceci de la Cruz will return for interiors. Having avenged her family’s brutal murders, Maria Diaz thought she could hang up her guns forever. She thought wrong. Something is slaughtering helpless immigrants, including innocent children. Once more, Santa Muerte, the saint of death, calls upon Maria to be an instrument of vengeance. And again Maria heeds the call, donning the guise of La Muerta. In her relentless pursuit of justice, Maria violently confronts Brujo, a crime boss / warlock and his sidekick assassin Sangre, “Loco” – a kill-crazy Luchador vigilante, and an ancient, remorseless evil that makes her question her very existence. What terrible price will Maria pay for the sake of justice? BRUJO: A modern day warlock who sacrifices his humanity to delve into the darkest of mystical arts. Aided by a cult of brutal mercenaries, Brujo awakens an ancient supernatural horror that prey on the most innocent of victims. Does Brujo want to become the kingpin of human trafficking and conquer the criminal underworld or are his motives far more? LA LLORONA: an unspeakable horror, La Llorona has crept out of the shadows of Mexican legend to once again prey on the most innocent of victims. 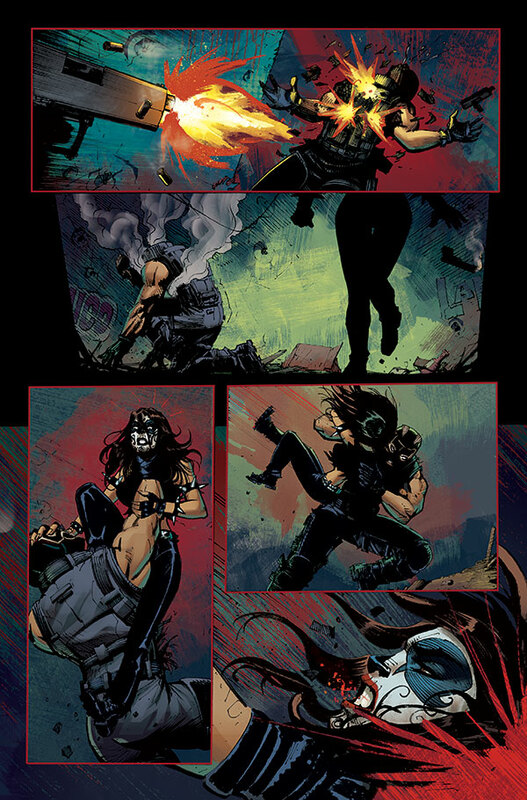 Will her terrifying wail be the last thing La Muerta hears? The La Muerta #1: Vengeance Kickstarter campaign will launch on June 14, 2017 at 7:00PM MST/PDT (Arizona Time) and will end on July 14, 2017 at 7:00PM MST/PDT (Arizona Time). Kickstarter backers will be the first to read this new story, months before it’s released to the general public! More details to come, including rewards reveals later this week! This entry was posted in News, Product News and tagged ceci de la cruz, joel gomez, kickstarter, la muerta, mike maclean, rian pulido, vengeance. Bookmark the permalink. Both comments and trackbacks are currently closed.